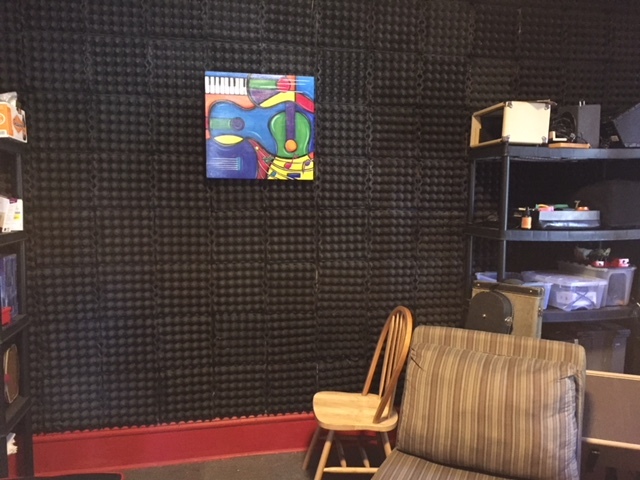 Jimi and Janet worked on getting the music room ready for lessons on Tuesday/tomorrow (should the weather not co-operate) and while fixing, cleaning and sorting, they got the picture up, that Amy brought when she came to paint faces a couple weeks ago. 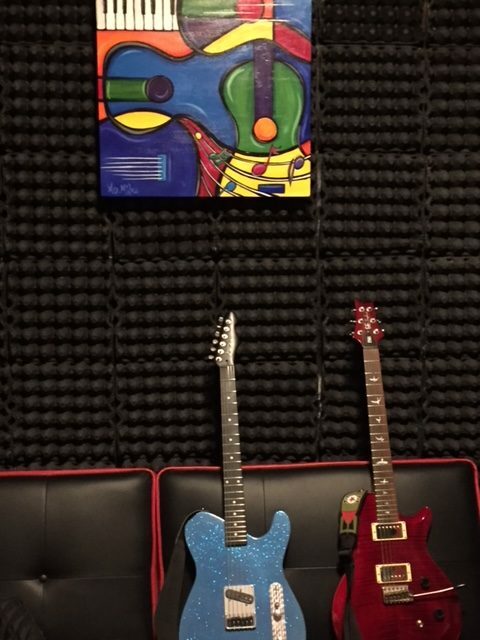 It’s so beautiful and the bright colors make it perfect against the black wall. We love it and the youngsters will too. Thank you Amy for your kind and perfect gift for a music house! Don’t forget about music lessons with Jimi Ray tomorrow from 6-7pm for the youngsters 11-16 yrs old. Some adjustments can be made on ages if appropriate. The musicians were invited to play afterward til 9pm. KOYC Radio will be kicking it up a notch with help from Jackie Massey who is taking over programming, building a website and creating hours of specific music for our listening audience. We think you’ll be very pleased as we move forward with some cool projects and changes, including story time one again from 7:30 to 8:00 pm weekdays for the youngsters. Get your FM radios out and let your imagines fly! 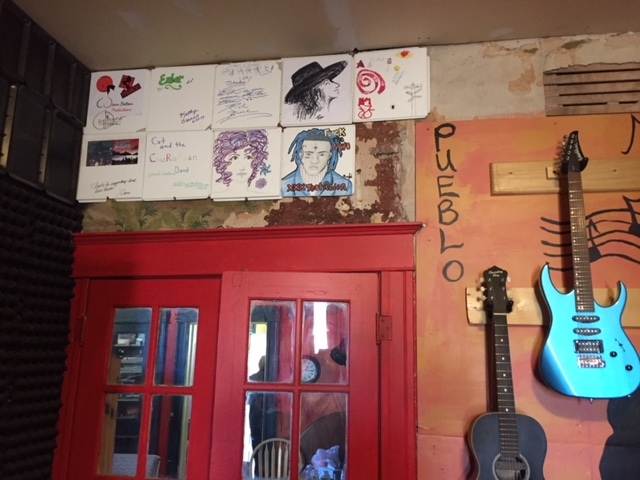 Musicians sign tiles and add their own design to display on the wall. 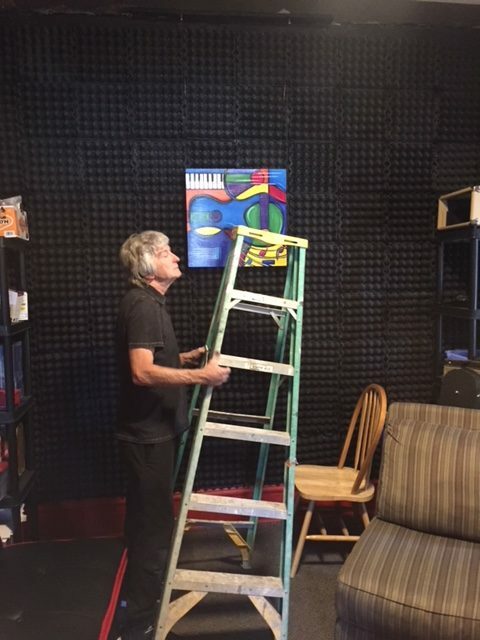 Jimi getting the ladder out of the way. Hanging by fishing line from the ceiling. Our egg carton walls are holding up great. 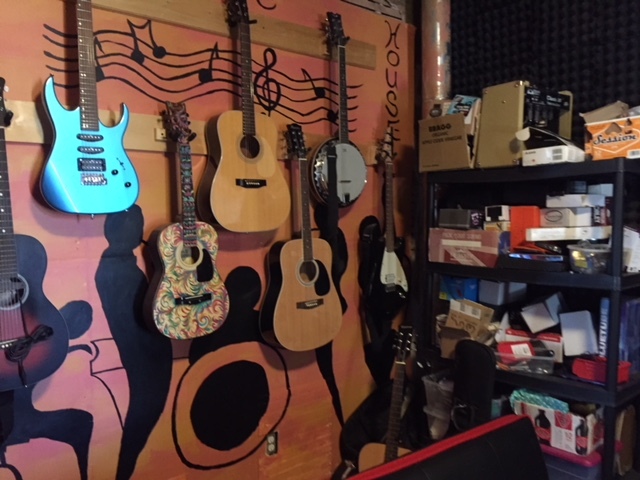 This entry was posted in Music House, OTR Foundation, PuebloHouse and tagged Janet Wilson, Jimi Ray, Pueblo Music house by Janet. Bookmark the permalink.